Control valve, on/off and modulating service. R40 valves have been designed to meet the need for an inexpensive but reliable single seat control valve suitable for on-off duty or modulating applications. They are offered with a complete specification including a choice of flanged or screwed bodies, metal or soft eating, direct or reverse acting actuators and all the usual accessories such as limit switches, pilot and solenoid valves, top mounted hand-wheel etc. 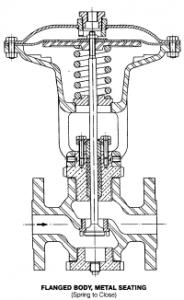 Valve plugs with a linear characteristic are used in both on-off and modulating valves, since this form of plug is ideal for non-shock and control service. 3 – 15 or 6 – 30 p.s.I.g. 25 sq.in – 9″ dia., 50 sq.in. – 12″ dia.